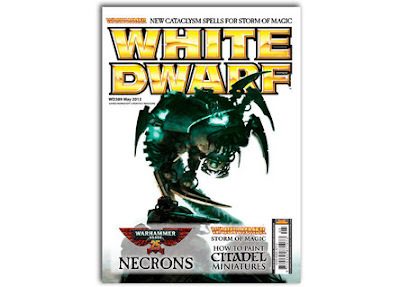 Just a quick post to recommend a read of White Dwarf 389. Really loving the updated layouts throughout and the new format of the painting sections is really good (and reflects the new 'How to Paint' book). It's been a while since my Necrons graced the tabletop as the Codex was well out of date and the range was limited. I'm very tempted to revisit the list now, and tryout some of the new figures in a Kill Team game, before investing in a more extensive army update. There are some great looking new pieces coming out in the next few weeks and I'm particularly struck by the Triarch Stalker and Tomb Blades. I'm also considering one or two of the finecast kits, but am a little reluctant by all of the negative press and recent bad experience of GW resin through Forgeworld. I'd be interested in feedback from anyone who has bought any finecast stuff recently. Hey man, I've been selling finecast bits n' bobs in the shop and the amount that ha been remarked as unsatisfactory is worrying. In other news Garys been writing up some necron matches he's had over the last few weeks, donno if they'd be good for your future plans or not?